Jack Fletcher is shipwrecked off the coast of Japan – his beloved father and the crew lie slaughtered by ninja pirates. 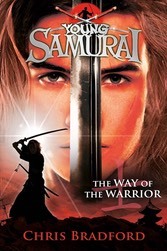 Rescued by the legendary sword master Masamoto Takeshi, Jack’s only hope is to become a samurai warrior. And so his training begins . . .
Voted one of Puffin's 70 Best Ever Books, alongside Treasure Island and Robin Hood.